Descendant of the house of David. Layman. Builder by trade; traditionally a carpenter, but may have been a stone worker. Earthly spouse of the Blessed Virgin Mary. Foster and adoptive father of Jesus Christ. Visionary who was visited by angels. Noted for his willingness to immediately get up and do what God told him to do. Orphaned when very young, she received no education and was working as a domestic servant by age 10. Blind by age 12; the cause of her blindness has not come down to us. Adopted by a community of Dominican tertiaries at Pavia, Italy. Sibyllina developed a devotion to Saint Dominic in hopes that his intervention would return her sight; when it did not, she came to accept it as her lot in life. She received a vision of Saint Dominic as confirmation of her desire to join the Order. At age 15 she became a recluse, living in a walled up cell. She spent her time in prayer, and her cell soon became a point of pilgrimage for Pavians seeking advice and healing; she lived there for over 60 years, doing penance, performing miracles, and spreading devotion to the Holy Spirit. Sybillina could sense the Presence in the Blessed Sacrament. Once a priest passed her window on his way to a sick call. She told him that the host was not consecrated; he checked and found he had taken a host from the wrong container. Second of nine children. Lifelong layman in the diocese of Rennes, France. Joined the Boy Scouts at age 10, and considered himself a Scout the rest of his life. Member of the Young Christian Workers (Jocists). Following the Nazi invasion of France, Marcel and some friends would go each day to the train station to assist refugees arriving from the east. Engaged to Marguerite Derniaux, but due to the war they never married. Conscripted into a forced labour camp in Thuringia, Marcel tried to use his time to minister to others enslaved by the Nazis. Arrested by the Gestapo on 19 April 1944 for membership in the Jocists, which was considered an outlawed secret society; the arresting officers said Marcel was being taken because he was "too much of a Catholic". Sent to camps in Gotha, then Flossenburg and finally the Güsen I and II parts of the Mauthausen, Austria camp where he did forced labour most of the day, was abused the rest, and finally died as a result of the miserable conditions. Martyr. 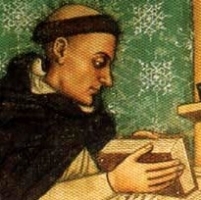 Dominican friar, receiving the cowl from Saint Dominic de Guzman in 1219. Priest. Founder and first prior of the friary at Pavia, Italy. Though he lived the life of a friar, he was a fat friar, for which he was mocked and ridiculed when he travelled to preach. Born a prince, the son of the Northumbrian King Alcred. King of Northumbria after the murders of his father and his brother Osred. Known for his charity to the poor and orphaned. Exiled to the area of Pictish Scotland and later murdered by agents of the usurping king Eardwulf of Northumbria. There are six churches in England dedicated to him. Studied at the University of Paris, France. 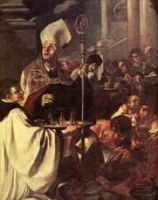 Dominican friar, receiving the habit from Saint Dominic de Guzman. Helped introduce the Dominicans to Scotland. Noted preacher. Bishop of Dunblane, Scotland in 1233, ordained by Pope Gregory IX. He constantly travelled his diocese, rebuilding churches, including Dunblane Cathedral, fighting for the rights of the Church, and evangelizing the laity. Worked on the Cause for the canonization of Saint Margaret of Scotland. Assigned to collect alms for the Holy Land in 1247. Excommunicated a group who tried to murder the king. Wrote a biography of Saint Dominic, a book on pilgrimages to the Holy Land, a history of the Dominican Order in Scotland, and translated a number of works. Joined the Franciscan Friars Minor in 1899 in the province of Santa Maria degli Angeli in Italy, taking the name Narcyz. Ordained a priest in Lviv, Poland (in modern Ukraine) on 1 June 1906. Arrested for his faith on 6 October 1941 by the Gestapo, he was deported, imprisoned in the Dachau concentration camp, tortured and finally murdered in the Nazi persecutions. As long as his health held out, he spent his time in the camp ministering to other prisoners. Martyr. Studied at the Pontifical French Seminary in Shkodrë, Albania, then in 1938 in Rome, Italy at the Congregation Propaganda Fide, and then theology at the Gregorian University. Ordained on 19 March 1944 as a priest in the archdiocese of Shkodrë-Pult, Albania. He returned to Kosovo in 1946 where he was known as a devout and hard-working priest. Imprisoned and tortured by Communist authorities during their anti–Christian persecutions. Martyr. Born to the nobility, he was a distinguished soldier. Exiled for killing a blasphemer with his sword, Andrea devoted the rest of his life to penitential acts of mercy. When he was allowed to return home to Siena, Italy, he founded a hospital and the Frati della Misericordia (Brothers of Mercy) to serve there; the Brothers wore a cloak bearing a cross and the letter "M"; their association died out in 1308. Franciscan. Priest. Taught theology at Bologna and Naples. Seventh minister general of the Franciscans from 1247-1257. Visited Franciscan provinces of different countries, including England. Papal legate to Constantinople. Retired to Greccio, Italy. Hermit in Syria. Fled to Pinna, Italy to escape Monophysite persecution. He arrived in the dead of winter; some hunters witnessed him sit beside a bare, leafless pear tree which burst full bloom due to the holy man's proximity. Founded abbeys in Pinna and Pesaro, Italy, and served as Abbot at Pinna for 44 years. Italian noble from the Marches of Ancona. Physician. Married layman; both he and his wife joined the Franciscans, she becoming a Poor Clare. Priest. Travelled Italy preaching and establishing charitable pawnshops for the poor, known in Italy as Monti di Pieta. Priest in Rome, Italy. 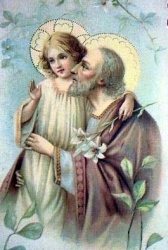 With Saint Amantius of Wintershoven, he evangelized areas of modern France and Belgium. Founded the church at Wintershoven, Belgium. Educated at Bangor Abbey. Monk. Spiritual student of Saint Comgall of Bangor and Saint Molu of Killaloe. Founded the monastery Achadh-Ur, now known as Freshford, in Kilkenny, Ireland, and served as its first abbot. Miracle worker and healer of the lame and the mentally ill.
Roman senator. Imperial officer. Favorite of emperor Maximian. Covert Christian during the first stage of the persecutions. After a letter from his mother and sister concerning their faith, he confessed Christ and was martyred. Monk in Maastricht, Netherlands. Spiritual student of Saint Landoald of Maastricht. Murdered by robbers while begging alms for his community. Venerated as a martyr for dying in the service of his brothers. Deacon from Rome, Italy. With Saint Landoald, he evangelized the area of modern France and Belgium. Founded the church at Wintershoven. Worked with Saint Patrick to evangelize Ireland in the fifth century. Bishop of Killossey, Ireland. Seventh-century monk in Brittany, France. Abbot of the monastery of Quimperlé in Finistère, France. Bishop of Saintes, France. Friend of Saint Malo, whom he sheltered in exile. Sixth-century saint who lived in the diocese of Saint-Brieuc, France, but no details have survived. Early bishop of Braga, Portugal. Martyr. Monk, probably at Moyenmoutier in the Alsace (part of modern France). A group of three sisters and a brother who were martyred together. We have little more than their names - Mark, Quartilla, Quintilla and Quintius.